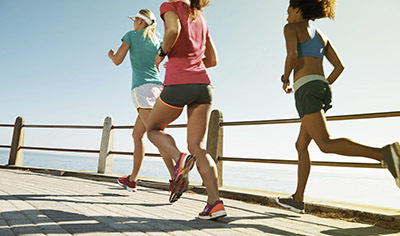 Summer is prime-time for outdoor exercisers, but every season has practical concerns. Drinking enough water and handling the heat are summer’s obvious biggies. > Drink 16-20 ounces of water at least 4 hours before you exercise. > Drink another 8-12 ounces 10-15 minutes before exercise. > During exercise, drink 3-8 ounces of water every 15-20 minutes. > If you’ve “lost” a pound or two after exercise, you’ll want to replace some fluid within the two hours following exercise as well. For every pound, drink 20-24 ounces of water. Remember that kids too, need extra hydration when they’re active. Children actually have greater fluid intake needs than adults relative to their body weight, and they’re faced with additional barriers to hydration such as not always recognizing when they’re thirsty, needing assistance to get water, and distractions. Scheduling regular “water breaks” in a child’s schedule, such as right when they wake up, or when they get home from camp or daytime activities can be helpful, as well as making sure they always have a full water bottle packed and on them when they’re away from home. Fatigue and headache can be the first sign of dehydration in both children and adults, so start pouring the water when these symptoms come up. If you’re building up your jogging endurance, Sara advises running through sunny patches of your route and walking through the shade, so you spend longer time in areas where it’s cooler. Plan your routes so you hit shade or woods as much as possible. As the dew point rises, running becomes more difficult and slowing down is a realistic plan for increasingly hot conditions. And wear sunglasses to help trick your eyes into thinking it’s cooler than it is. Shady local running spots include the South Bend bike path, particularly between Angela Boulevard and Madison Center. St. Patrick’s Park offers dirt trails through the woods, and the Notre Dame lakes have good stretches of shade as well. Or, run while the whole world is shady – before sunrise or after sunset, taking safety measures so that you’re visible to traffic.